Featuring one of the finest playfields available, the 12-Foot Champion Qualifier Shuffleboard Table is a sensible, quality shuffleboard table designed by players themselves. Constructed with a solid Canadian maple playfield with a polymer finish plus a selection of four attractive color options, this is the ideal Champion shuffleboard table for beginners and advanced shufflers. It's manufactured in three parts to allow for easier shipping. As with most of our top-notch shuffleboard tables from The Shuffleboard Federation, the Qualifier table can be customized to your liking with a full-color logo, a light kit, additional scoreboard styles and more. This quality board can be ordered with the J-Bar Scoreboard, Champion's best-selling scorekeeper that features a double-sided display and a single set of scoring buttons. The Qualifier is designed to add fun to any space. 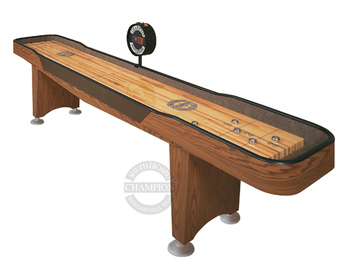 While this model measures 12 feet in length, it also comes in 9-foot and 14-foot options, all of which are available at The Shuffleboard Federation. Playfield: 10' 8" long x 16.5" wide x 1.50" thick (5" with the climatic adjusters). Other Available Sizes: 9' and 14'. Cradle Length: 12' overall, comes one 12' section. Cradle Height: 9" at tallest point.